Reckless Abandon, brilliant winner of last month’s Group 1 Darley Prix Morny at Deauville, has been purchased by Darley in a deal brokered by Blandford Bloodstock. The unbeaten son of Exchange Rate is to be leased back to owners Julie Deadman and Stephen Barrow and will stay in training with Clive Cox until the end of 2013. Reckless Abandon is unbeaten in four starts this year. After breaking his maiden at Doncaster in May, he won Royal Ascot’s Group 2 Norfolk Stakes. 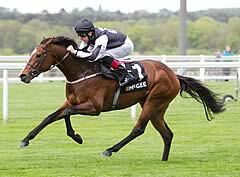 Victory in the Group 2 Prix Robert Papin was then followed by a hugely impressive display in the Group 1 Darley Prix Morny, a race that has produced the likes of stallions Dream Ahead, Dutch Art, Bushranger and Bahamian Bounty in recent years. The Darley Prix Morny’s roll of honour also includes Zafonic, Arazi, Machiavellian, Irish River and Blushing Groom.